100% Pure Natural Ingredients with 800mg with 50% Green Coffee Antioxidant. No fillers within a veggie capsule. 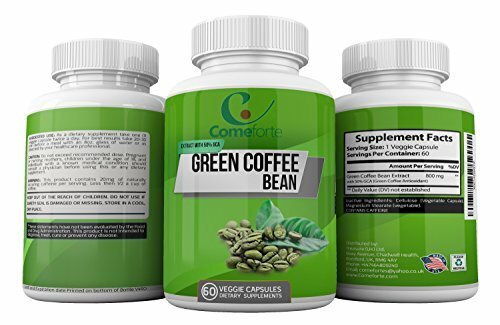 Benefits from using Green Coffee Bean Extract offers: Promotion of weight loss, reduced carbohydrate absorption, lowering of blood pressure, increase metabolism, lowering blood sugar and cholesterol. Lab tested, certified and made in USA. Safe for use by women and men. WEIGHT MANAGEMENT: Losing weight is a challenge and difficult at the best of times. But we keep trying, as it's not just the losing of the excess weight, but it's trying to reach the goals, expectations & the aspirations that seems to slowly disappear and we put on hold - waiting to be THE RIGHT SIZE - THE RIGHT ME. Try our Green Bean Extract which offers pure, premium ingredients which clinical studies has shown promising results for weight loss. Go on, you have everything to gain! View More In Green Coffee Bean Extract. If you have any questions about this product by Comeforte, contact us by completing and submitting the form below. If you are looking for a specif part number, please include it with your message.